Anyone have a good source that is reasonably priced. A through search revealed the lack of one on my boat. Oops. You don't really have to have it on a separate board, it just has to be put someplace in the engine room where, if it was removed the removal would be obvious. Mine was painted onto the FB under the starboard lazarette, basically inaccessible with everything packed in there, so I ordered a plastic plaque and glued it to a more visible spot. Well, in fact, the documentation number is not supposed to be removable; it is supposed to be permanent. But, if you want it on a board that's pretty, many sign shops can engrave one for you with the right size and style of numbers. I had one made here in Philly for about 1.5 boat dollars, on my own piece of Makore which I then glued into the boats' woodwork. The documentation # must be of proper size and form as outlined by CG (NO.######) and carved or affixed to your boat in a way that can not be easily removed without damaging structure. Don't exclude the NO and period(NO.) before the number. screwed in no good, epoxy glue behind a wood plaque probably ok if affixed to a none removable structural component (not a cabinet door etc.,) a simple and cost effective way I suggest particularly on FG boats is to paste the same #s sold in chandleries for state #s to the inside of the hull in motor room or locker wall and then cover the #s with a six inch FG tap all soaked in epoxy. The black #s show through the somewhat translucent tape clearly. 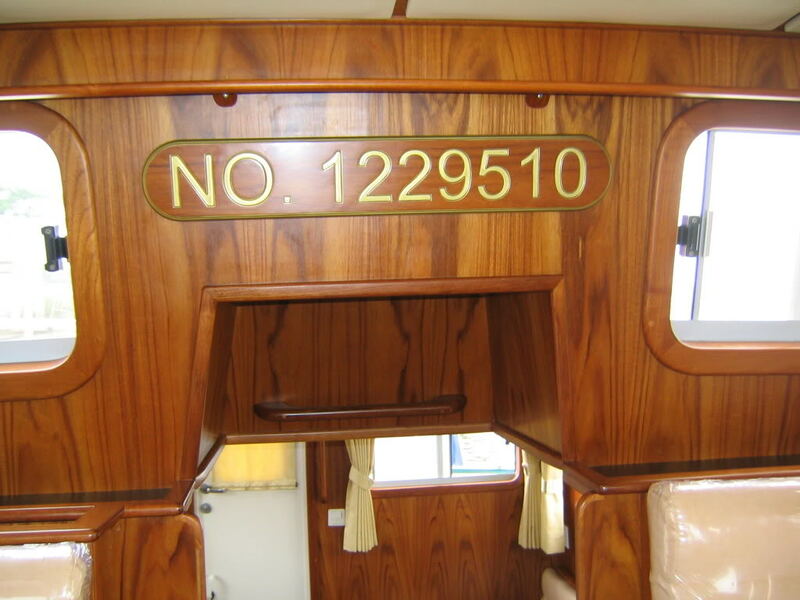 On metal or wood boats engraved #s on a structural or inner hull section are advised. As a certified CGAUX vessel safety inspector I have to verify that documented vessels comply and many do not. For what it's worth, I used Documentation Boards Inc for my boat and was very disappointed in the service. It took forever to get the board. I would not recommend them. I just went back and looked and it was three weeks before they even started to make it, and over 4 weeks before I got it. I documented the boat before construction was complete. I ordered vinyl numbers. Same as boat name. I think the pictured example would fail the difficult to remove requirement. Mine are installed on a wall in the head. While I understand the screw on boards don't technically meet the requirement, I have never heard of an issue for recreational documented vessels. Commercial may be a different story. If they are epoxied on as well...not sure why they wouldn't. The USCG probably does understand that ever since wooden boats, changing a doc number on a boat and hiding the old one isn't rocket science.